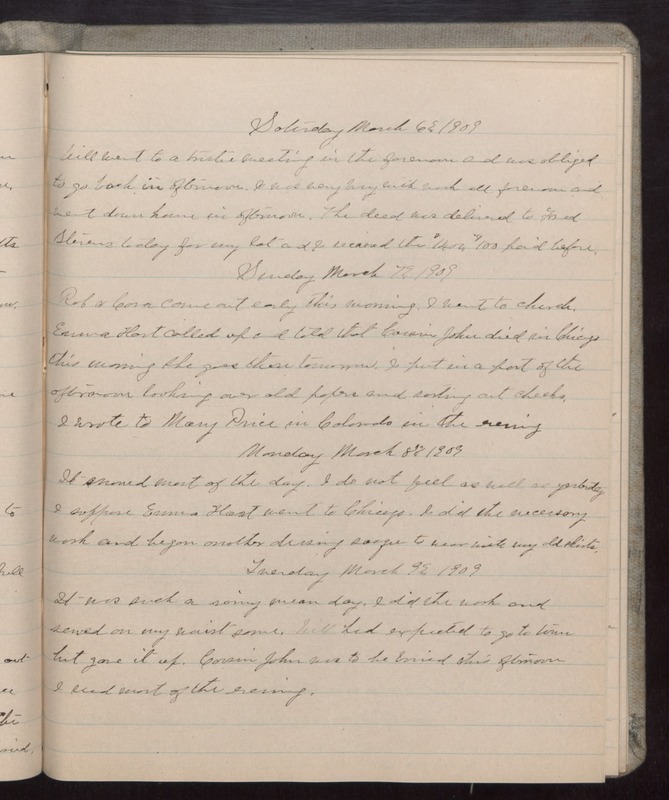 Saturday March 6 1909 Will went to a trustee meeting in the forenoon and was obliged to go back in afternoon. I was very busy with work all forenoon and went down home in afternoon. The deed was delivered to Fred Stevens today for my lot and I received the $1400. $100 paid before. Sunday March 7 1909 Rob & Cora came out early this morning. I went to church. Emma Hart called up and told that Cousin John died in Chicago this morning She goes there tomorrow. I put in a part of the afternoon looking over old papers and sorting out checks. I wrote to Mary Price in Colorado in the evening. Monday March 8 1909 It snowed most of the day. I do not feel as well as yesterday I suppose Emma Hart went to Chicago. I did the necessary work and began another dressing sacque to wear with my old skirts. Tuesday March 9 1909 It was such a rainy mean day. I did the work and sewed on my waist some. Will had expected to go to town but gave it up. Cousin John was to be buried this afternoon. I read most of the evening.